A few months after my intensive care stint in 2003, I found myself washing my hands a lot more. I had developed obsessive compulsive disorder I found it very hard to accept that I might have had Myasthenia gravis . until I later found out the fact I had Multiple mitochondrial DNA deletions Something clicked in my head and put me into a robot mode and I felt I HAD to wash my hands from time to time. I blamed the cleanliness of intensive care unit because I felt if my hands were clean I wouldn’t get ill again or catch another ear infection and lose my cochlear implant. I was just freaked at the fact that I might lose my other cochlear implant and be in a silent world for the rest of my life. Although I knew I’m already profoundly deaf, I hated the fact I might lose my cochlear implant and never hear my family and friends voices or music etc again. I began being very protective about my ears and wouldn’t let anyone else touch them apart from my mum and my doctor. I began being more looser on the protective mode on the left ear because of my cochlear implant but I never let anyone touch my right ear because I felt I still had my ear infection and if anyone or anything touched my infected and touched my other ear, I would go into question mode – “is my ear ok?” “Is that ok?” In my case I keep saying “you promise?” Even now (2008) when I know my ear infection has healed, I still wont let anyone touch it. I knew it was not normal of me to do so but I couldn’t help myself and felt I had to do it. I still have OCD and get very frustrated and wish I didn’t have it because it really gets on my nerves and can be time consuming. I get very angry at times and lash out because I know I shouldn’t be doing it and wish I was better. I began to look for help. My G.P put me in touch with a doctor about it. He recommended I try behavioural therapy. It helped for a bit but I found it hard because the lady I was working with was very judgemental towards me and told me I was being lazy! I felt so angry about that and I stopped it there and then! I went back to the OCD doctor with my parents and the OCD doctor suggested trying Prozac, he told me it would be 4 weeks before it started working. I began taking Prozac and after a month on them, one evening I felt my lip getting big and puffy. It wasn’t till my parents came home from a night out that I noticed something was wrong because my mum was shocked when she saw me. She rang the Medical helpline on the phone for advice. The advice was to keep an eye on me and if it was no better in the morning see a doctor but as it was a Saturday night we would have to go to casualty. 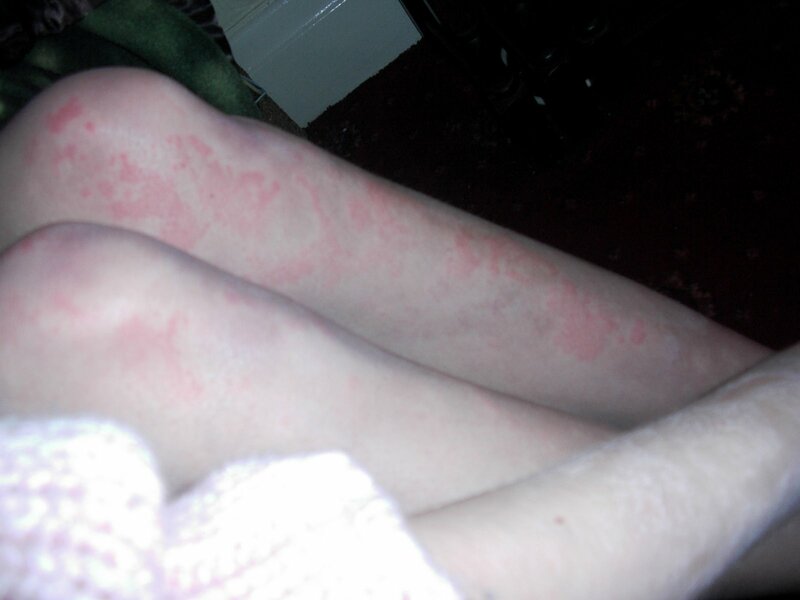 Overnight, it had got worse and my face had become very puffy and I had a rash all over my body. My eyes were closing up that I could hardly see. My parents took me to casualty the next morning, I went there in my PJs, I was very scared and I was holding on to my mum because she was guiding me where to go. I saw a doctor after half an hour and he checked me out. We told him about the medication I was on but he told me I should keep taking it as it’s an anti depressant. He gave me some steroids to take home. I took the steroids (they were pink dissolvable ones and yes they tasted horrible!!) and as soon as I got home and it seemed to get better but then that evening I took my Prozac as the doctor had told me too, it flared up again so we saw my GP the next day. She told me that it was obvious that the Prozac was the cause of the reaction and that casualty should have never told me to keep taking them! I stopped taking them and I began to get better. It turns out I was allergic to the SSRIs in the Prozac. We made a complaint about this. When I went back to my OCD doctor we told what had happened and he gave me Clomipramine instead. I wasn’t happy about being on medication as it’s what I wanted to avoid. After a year on Clomipramine, I decided to stop it because I felt it wasn’t helping my OCD. It was still the same as it ever was and there was no point of being on it. I began to get better for a bit. I have my good days and my bad days although now in 2008 it’s getting a bit worse so I have decided to try behavioural therapy again. I want to beat the OCD because I hate having it and it can be very frustrating at times, I get very angry about it. Hopefully one day will be free of it. 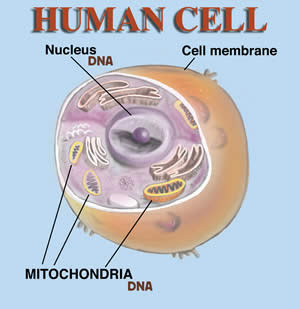 In Summer 2004, I went to my appointment with my parents at Bradford and Mr Busby told us that I had “Multiple mitochondrial DNA deletions” a condition that affects my muscles and my energy genes. He explained that it was the cause of my profound deafness, my fussiness with food was down to the fact I chose easier foods to eat because of my swallowing. It also affects my muscles and energy levels leaving me tired at times. The ear infection I had in my right ear was down to the fact I wasn’t getting the right nutrients from the foods I was eating and my droopy eyelids were also a factor of the condition. 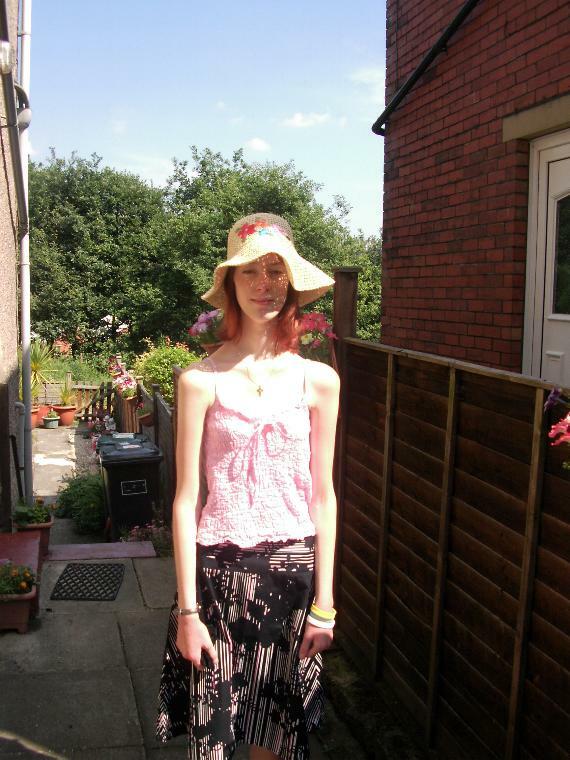 The main factor was my weight and how I could never put any on and after the month I had in hospital at Christmas, my weight was 6st and I was left very skinny for my age of 18. I worried if I couldn’t put the weight back on and look a bit healthier. I had never been to Newcastle before and it was 3 hours from where we live! Quite a way to go to see a doctor for an appointment but Mr Busby assured us we would still be seeing himself between appointments at Newcastle for checkups. So in May 2004 went up to Newcastle Victoria Infirmaty. We went to Metro Centre for a break and refreshments. Having got lost on the way to the hospital, we were slightly late for our appointment! We had never been in to the city centre of Newcastle before but my dad who is a wagon driver was very capable of finding it! We went in and met Mr Tunrbull, who was very nice and friendly. Mr Turnbull asked us a lot of questions regarding our family history like the fact my brother didn’t have the condition, he also told us more about the condition I had. He sent me for a blood test which was right accross the other side of the hospital and came back to Mr Turnbull. He told us that it was very rare that someone of my age (20) was showing the signs of Multiple mitochondrial DNA deletions as this doesnt happen til you are in your 40s, It was all very intresting to know. In January 2004, when I had an hospital appointment Mr Busby thought it was worth having a muscle biopsy to determine whether I had Myasthenia gravis because of the fact I was unable to put weight on, my deafness and droopy eyelids. I got quite worried about this because it sounded scary! I knew it had to be done though to find out what was wrong with me. I went in for the usual routine pre- op things to check and meet the surgeon that would be doing my muscle biopsy. I wasn’t sure what to expect from a muscle biopsy but the surgeon told me all about it. 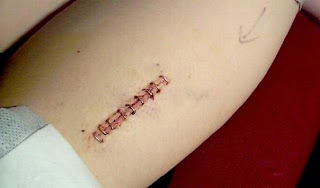 At the end of January, I was admitted to hospital for the muscle biopsy. My mum came with me for support. I wasn’t looking forward to it and once I got into my hospital gown, I start to worry a lot. The surgeon came round to ask me which leg I would like the muscle biopsy on. I chose my left leg. 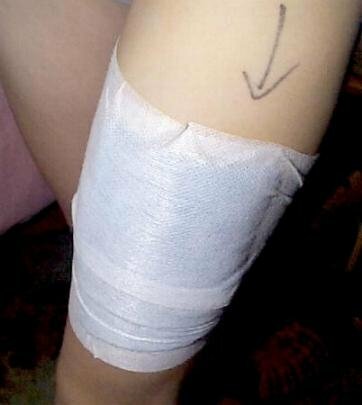 He drew an arrow with purple pen on my leg to show where it would be. It looked funny having an arrow on my thigh! When the bed came to take me, I burst into tears because it was so scary for me. My mum tried to calm me down and the surgeon told me if I didn’t calm down he would not be able to perform the muscle biopsy. I took a big breath and forced myself to calm down and get on the bed. I got to theatre and they needed to give me a local anaesthetic in my thigh. 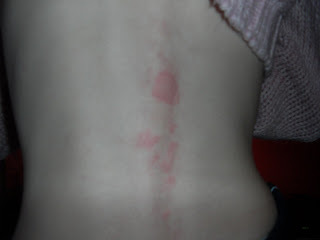 Once the first one went in I screamed the hospital down because it was stinging so bad! I was wriggling about because of the pain so the surgeon took his chance and put a few locals in my leg and I nearly broke my mum’s hand!! The combination of being upset and having the local was very traumatic! Once the local had begun to work and part of my thigh became numb, I settled down. I felt cold because I was in a thin hospital gown and I began to shiver as they wheeled me in the theatre. The surgeon put a cover between my head and the rest of my body. A nurse began talking to me asking me questions about my life to distract me from what was happening. I came back with a neat tight bandage around my thigh and I had no pain YET! I was told I could go home or stay the night at hospital. I opted to go home! 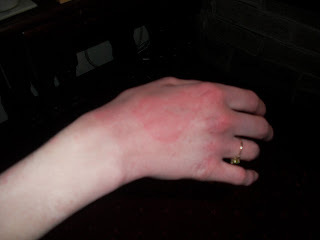 The nurse told me if it got painful, I should take a painkiller or some Calpol. As I can’t swallow tablets, I went for the Calpol! My dad came to pick me up from the hospital in the evening when he had finished work. My mum helped me get dressed and ready to go home. My dad stopped at the supermarket on the way home and mum bought me some Calpol. I was relieved to get home and rest my leg on the sofa! It was painful going up the stairs to get to bed. My brother yet had to give up his bed for me and I was out like a light! After 5 days I went back to the hospital to have the bandage taken off, when they took it off I was shocked to see 9 staples in my thigh. I was very relieved to get the bandage off as it was tight. The nurse gave it a clean and put a new dressing on it. I would be getting my staples out my local GP’s surgery in a few days time! I had the 9 staples taken out by a nifty gadget and it was painless! The nurse put another dressing on to let it heal. I now have a small scar on my left thigh! It’s quite cool and reminds me of what I went through and how brave I was! The biopsy was send to Bradford and Newcastle hospital for testing. When I got to the intensive care unit, the nurses were very nice and told me not to worry. As they wheeled me in, I saw lots of machines and people with tubes in them but I was too weak to be bothered by it. I just wanted to be better again. Mr Busby decided to try a plasma exchange, (which puts your blood through a machine and cleans it and then returns it to your body) to give my body some strength. They couldn’t find a visible vein on my arm so they had to do in a vein in my groin; a surgeon used an ultrasound scan to determine where to put it. I hardly felt a thing to be honest because I was just lifeless and so tired. After 3 days in intensive care, I was moved to an adult ward in a private room. I had 6 plasma exchanges and each of them took 2 hours to do. After each plasma exchange I felt myself getting stronger and I began walking around with the help of my mum. I had visits from my dad every evening and my brother came occasionally! After a week or two I started to eat slowly again with easy food that I could swallow like yogurts and mashed up fruit. Mr Busby came round and told me what he suspected, “Myasthenia gravis“ a serious muscle weakness condition. I worried how it would affect me and got a bit depressed the more I knew about it. By this time, it was December and I would have been out buying presents for my friends but I was in hospital. I wondered whether I would be out in time for Christmas Eve as I didn’t want to spend Christmas in hospital, I wanted to spend it at home with my family. Thankfully, I was nearly well enough to go home and agreed to discharge me if I drank a nutritional milkshake and take some steriods everyday. I agreed and they took my feeding tube out from my nose! It was very uncomfortable but I was pleased it was out. I was home on the day before Christmas Eve! Although I was feeling rather isolated despite having all my family and friends at our house and I tried to join in the festive season. I had various check ups over the Christmas holidays. I felt very depressed about the fact I might have Myasthenia gravis and how I would cope with it. My family and friends reassured me that I would get through it. I was so grateful to hear those words at the time and motivated me to get better! As a result of having ear infections in my right ear that I lost my cochlear implant in, I still underwent operations on my right ear to see what the problem was as Mr Raine was puzzled by it.In November 2003 when I was 18 Mr Raine was undergoing a routine operation for last attempt to find out the problem and he put an ear wick to soak up the ear infection.It was not successful. The day after the operation, I began to get aches and getting a bit stiff but I put it down to being in a hospital bed! Even a walk around the ward to stretch my legs didn’t help but I wasn’t worried about it. I was discharged from hospital and over the next few days, I began to go downhill, it started with my legs being weak and I couldn’t move them very well. I had to swap rooms with my brother because I couldn’t find the strength to get up my bunk bed in my room. I found myself not being able to sleep because I was getting aches all over and the following days each part of me got weaker….I couldn’t eat because I found it hard to swallow food; I couldn’t even lift my head or even stand up without collapsing. My mum slept in the room with me because whenever I needed to go to the toilet, she literally had to lift me up and guide me there. I got very frustrated because I couldn’t do anything myself, I would be in the verge of tears every time I tried to do something as simple as lifting up my head. A week later, I was still wide awake without a wink of sleep since I left hospital. I spent a Sunday morning watching the rugby world cup on TV with my mum and England had won the world cup. After watching that match, my mum decided enough was enough and called the GP for me the next morning. The GP agreed that I was very poorly and ordered an ambulance to take me back to hospital. I arrived at the hospital with mum a few hours later and they got me settled on a ward and waited for the doctor to come round to give me a check up. I just couldn’t be bothered dealing with anything because I was so weak and wanted to sleep but I couldn’t. My mum had to go home as visiting hours were over and I was distraught at this because I needed a familiar face with me. The first night at the hospital was awful, I was given a sleeping medicine and asked the nurses to make me comfortable because I couldn’t move myself but they walked off and left me to it! I felt so helpless and I just wanted my mum Although one nurse put the buzzer next to me to press if I wanted any help, one of them took it away from me and put it out of reach and I couldn’t even sit up to press it and I cried myself to sleep. My mum came the next morning and made a complaint about it. The morning doctor came round and checked me out and agreed that I was extremely poorly and sent me to hospital ward after hospital ward but at one point I ended up on an old people’s ward where I stayed for a few days. My mum was disgusted with the hospital because I should have never been on that ward and made yet another complaint. On that particular ward, I was told by a friendly doctor Mr Busby that they needed to get some nutrition into my body and that they needed to put a tube down my nose into my stomach. I was attached to a feed to try and get me feeling a bit better as I hadn’t eaten as much as a yougurt in a week and my weight had dropped from 7st to 5st.Mr Busby came back to see me a few days later and I was slightly better and told me I was still very sick and that I would be going to the intensive care unit. Mr Busby thought it may be Myasthenia Gravis but wasn’t sure until further tests. For now the idea was to get me back on my feet and feeling better! My 2nd operation was shorter than the last. It was November 2000 and I had just finished my mock GCSEs I knew the routine by now when it came to operations, the pre-op appointment and the tests but I never got used to the being put to sleep stage as I’d had so many and I’d hated the cannula needle that they put in your hand to do it. No matter how many operations I had, it got worse. I actually felt fine during this particular operation though because I knew I was going to hear again and I was grateful for the chance.